Cyclone Caroline underwent explosive cyclogenesis early on Thursday, rapidly deepening to a 963 mbar central pressure at 10h UTC on December 7. 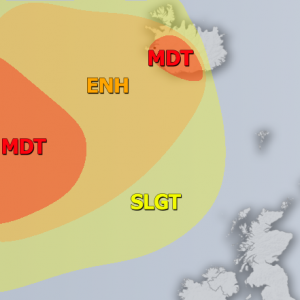 Parts of Scotland, Faroe Islands and SW Norway were hit with up to hurricane force winds. Morning (Dec 7, 9:15 UTC) analysis of cyclone Carolina [by Guido Cioni]. The system underwent explosive cyclogenesis dropping from 982 mbar at 15h UTC on Dec 6 to 965 mbar at 6h UTC on Dec 7 – a drop of 17 mbar in 15h, true bombogenesis, as reported by Centre Meteo UQAM. The center of the cyclone moved just north of Scotland during the late morning and early afternoon hours of December 7, with central pressure hovering around 963-965 mbar. Peak wind gusts of 187 km/h were reported at Cairngorm (1245 m elevation), with most locations in northern and central Scotland reporting gusts in 110-140 km/h range. Gusts up to 110-140 km/h were reported along the southwestern coast of Norway and well over 160 km/h offshore. Dec 6 afternoon image of the rapidly deepening cyclone Carolina, showing a double vortex center. Image: NASA Terra/Aqua MODIS. Find several videos of cyclone Caroline in Scotland and Norway below.